The global ‘fisheries crisis’—in which fish stocks are depleted, environmental destruction has reached an apex, and small-scale fisheries are disappearing—is causing irreversible damage to both the fisheries sector and communities sustained by fishing activities. Governments implement stricter regulations and resource management strategies in an attempt to solve the crisis, but these approaches typically leave out the perspectives of small-scale fishers. Despite this, fishing communities are constructing innovative ways to make their voices heard and to protect their lives and livelihoods. The overlap of the global food crisis (sparked by the 2007-2008 food price spike), and rapid economic growth occurring in the BRICS countries (Brazil, Russia, India, China, and South Africa) has contributed to significantly altering patterns of food production, consumption and trade worldwide. Economic growth has also facilitated changing dietary preferences, contributing to a rising global demand for animal protein. Fish protein has become particularly popular in light of health warnings about industrially farmed animals and eating too much red meat. This has caused fish consumption to double worldwide in the last 50 years. Rising consumption has intensified pressure on the global fisheries sector—particularly to meet the demands of highly populated countries like China. Even South Africa, which has the smallest economy and population among the BRICS, saw fish consumption increase by 26% between 1999 and 2012. In terms of production, China is by far the world leader, and at its 2012 peak contributed 70% of fish to the global supply. Between 2012 and 2014, it further expanded its capture fishing sector by almost 2 million tonnes and its aquaculture sector by nearly 5 million tonnes. India produced at a similar level, contributing 50% of the global fish supply in 2012—ranking third in global capture fisheries (after China and Peru) and second in aquaculture. South Africa has one of the largest capture fishing sectors in the African continent, contributing approximately US$ 435 million to the national economy in 2012. Capture fishing in South Africa is an important source of livelihoods for many coastal communities, of which a large proportion engages in small-scale fishing. Of the 43,458 commercial fishers and 29,233 subsistence fishers in South Africa, approximately 50,000 are considered small-scale. [i] However, despite comprising almost 62% of the fishing population, the South African Department of Agriculture, Forestry and Fisheries’ national policies have historically not recognised the particular needs of small-scale fishers and the difficulties they are facing, focusing instead on expanding the large-scale industrial fishing industry. This has sparked intense resistance from fishing communities. After the government adopted its 2005 long-term fisheries policy, leaving small-scale fishers without any access or fishing rights, a group of fishing communities, led by community organisations Masifundise and Coastal Links, took the issue to the South African Equality Court. The Court finally ruled in favour of the development of a new policy. 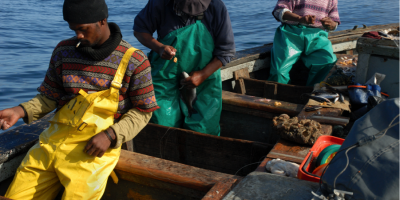 In 2012, the new Policy for the Small-Scale Fisheries Sector in South Africa was completed, introducing new strategies for managing the sector, which aim to secure rights and access for communities by prioritising human rights, gender, and development as key issues. This marked an important victory for South African fishers, demonstrating their capacity for mobilisation and to achieve change. In 2014, Masifundise and Coastal Links also published Small-scale Fisheries Policy: A Handbook for Fishing Communities, providing fishers with accessible information on how the policy could be applied in their daily lives. Considering South Africa’s 2012 policy was developed partly as a response to pressure from fishing communities, it has set an important precedent for future fisheries policies, both nationally and internationally. Masifundise and Coastal Links also played key roles in discussions with the FAO’s Committee on Fisheries (COFI), which led to the publication of the Voluntary Guidelines for Securing Sustainable Small-Scale Fisheries in the context of Food Security and Poverty Eradication (SSF Guidelines) in 2015. These guidelines were the result of a bottom-up participatory process that included 4,000 representatives from small-scale fishing communities, governments, fish workers’ organisations, research institutes, and NGOs. The development of the SSF Guidelines and South Africa’s national policy signal an important shift in the perception and governance of fisheries sectors. While small-scale fishers have been crucial contributors to the global food system for generations, their rights are only now beginning to be more formally recognised. There appears to be an important connection between this newfound recognition and increasing mobilisation within fishing communities both nationally and around the world. Increasing mobilisation among fishers, particularly within the last few decades, has demonstrated their commitment to participating in, and shaping, the transformation of the fisheries sector and its socio-political context. Fishers are also joining forceswith farmers, pastoralists, rural, and indigenous peoples, as overlapping food and climate crises highlight common struggles between social movements. Their shared commitment to creating a fair food system has contributed both to a transnational convergence of resource justice movements (e.g. agrarian, climate, environmental), as well as the emergence of what I would argue is a global ‘fisheries justice’ movement. A key actor in this movement is the World Forum of Fisher Peoples (WFFP), of which Masifundise and Coastal Links are active members. Founded in 1997, the WFFP now links 43 national small-scale fishers’ organisations in 40 countries around the world. It focuses on addressing the issues threatening small-scale fisheries (e.g. privatisation, climate change) and advocates for fishers’ human rights and secure livelihoods. The WFFP holds a triennial General Assembly and an annual Coordinating Committee meeting for member organisations to come together, reflect on their goals and actions taken, and develop new strategies for the future. In an era when power within the food system is increasingly being concentrated in the hands of a few huge corporations, movements of small-scale food producers and their allies offer alternatives based on social justice, sustainable production methods, and protecting the environment that rejuvenate hope for the way forward. Elyse Mills is a PhD researcher in the Political Ecology Research Group at the ISS. Her PhD research focuses on the dynamics of fisheries and fishers’ movements in the context of global food and climate politics. She also co-coordinates the Initiatives in Critical Agrarian Studies (ICAS), and is part of the Emancipatory Rural Politics Initiative (ERPI) Secretariat.